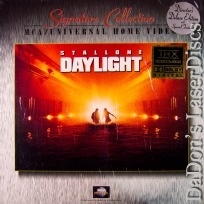 Daylight 1996 - 115 min. - Color Genre: Action Rated PG Country: USA LaserDisc Movie Storyline: An explosive traffic accident traps hundreds of commuters in a collapsing tunnel beneath the icy waters of the Hudson River. With the river bearing down on them, the panicked survivors struggle to free themselves. Only Kit Latura, the shamed former head of Emergency Medical Services, can help them escape their watery crypt. This release includes an exclusive, behind-the-scenes featurette on the making of the film. Academy Awards Nominations: Best Sound Effects Editing. 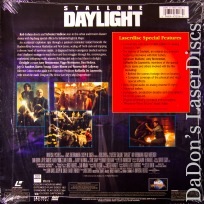 LaserDisc Movie Review: Sylvestor Stallone comes to the rescue in this disaster/adventure picture. A truck containing dangerous chemicals explodes in the Holland Tunnel, trapping those New Yorkers not killed in the explosion. Authorities know there are survivors, but cannot figure out what to do to save them. Ruptured water mains and leaks in the tunnel itself, which is beneath the Hudson River, will cause it to fill with water in a few hours. Of all the colorful characters trapped there, only Roy Nord (Viggo Mortensen), a mountain climber, has any ideas about what to do, but he quickly dies while attempting to save the others. However, Kit Latura (Sylvester Stallone) is a former city Emergency Medical Services director who was in the area of the explosion, and he knows the tunnel's construction quirks. He quickly convinces city officials to let him wend his way through the tunnel's maze of exhaust fans to help the exhausted survivors confront the obstacles that await them. --- Clarke Fountain The disaster and action genres meet in this Sylvester Stallone vehicle that hews closely to the structure of his last successful motion picture, Cliffhanger (1993). Character cliches abound, wooden dialogue is the order of the day, and telegraphed plot points proliferate in this by-the-numbers "entertainment." Viewers are asked to accept a number of preposterous assertions in the screenplay by Leslie Bohem. Among them --- that New York City's emergency management officials will be unable to function at all in a real-life disaster, that a sole EMT worker (and a disgraced one at that) is the only man for the job of saving trapped civilians (hasn't the world seen enough photos of disasters to know that hundreds of rescue workers would quickly spring into action ), and that such an event could seal off both ends of a Hudson River tunnel. There are many more moronic artistic choices in Daylight, but many of them (especially one involving rats) would constitute revealing spoilers. Suffice it to say that the malarkey quickly becomes hip-deep in this waste of valuable cinematic resources. Bohem would go on to repeat many of the same storytelling sins the following year in Dante's Peak (1997). --- Karl Williams Thanks for Visiting DaDon's Rare LaserDiscs ! Reviews, Articles, Newsletter and Information for Movies on LaserDisc LD Laser Disc, LazerDisc.